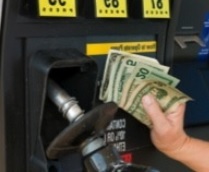 The national average is at its lowest price for this date since 2010 when gas averaged $2.73. The five-cent drop in the national average in the last week is the steepest one-week drop since July. The Oregon average is at its lowest price since April of this year. Both the Oregon and national averages are below their year-to-date highs. The national average peaked at $3.70 a gallon on April 28. 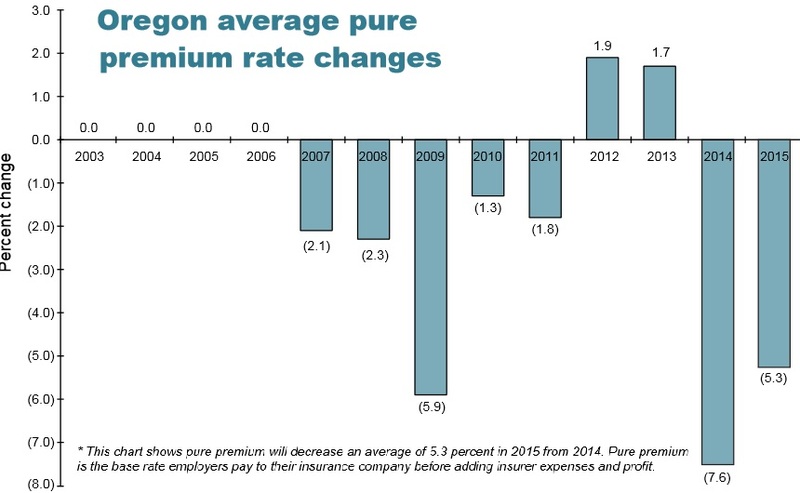 Oregon’s average reached its 2014 high of $3.99 on July 3. For the past few years our friends over at the Department of Revenue, Research Division have been providing us with more detailed information based on tobacco wholesaler tax forms for non-cigarette products. 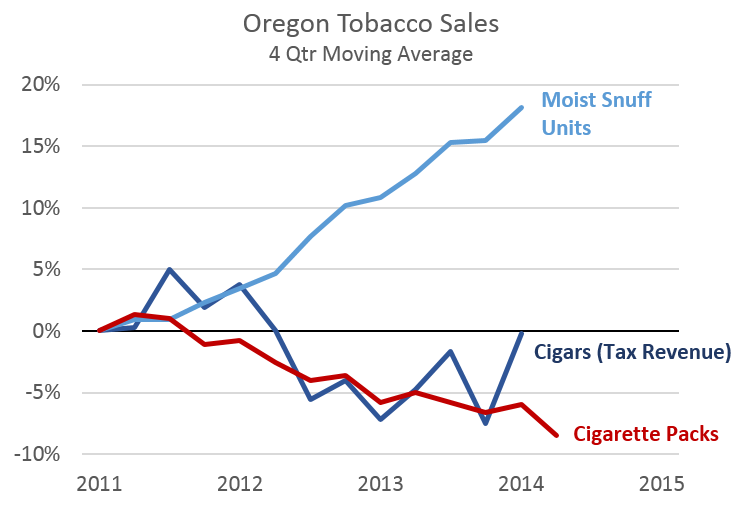 Cigarettes still dominate tobacco tax revenues across the country — in Oregon cigarette taxes are about 3.5 times as large as other tobacco products last fiscal year — but cigarettes have been in long-run decline in recent decades, while other tobacco products, largely, have been growing, at least as a share of the tobacco industry. Based on this relatively new data (for us, anyway) one can see the diverging trends in tobacco products sold in the state in recent years. The number of cigarette packs sold is down nearly 9 percent since the beginning of 2011 — and the border tax is certainly in play here but suggests that the fundamental, Oregonian decline may be larger. Taxes from cigars are relatively flat, however the trends within this category are diverging. Revenue from low priced, single use cigars (costing about $0.77 or less) are down, while revenue (and the total number) of cigars subject to the maximum tax of $0.50 are up. It is unknown how much of this change is due to product price inflation alone — meaning those lower priced cigars have increased themselves to above the cap — or some other consumer trends/switches in the marketplace. Voters strongly oppose action to retroactively limit tax inversions, according to a new poll released today by the U.S. Chamber of Commerce’s “Fair Reform for Growth” campaign. The nationwide survey of likely voters, conducted by Purple Insights, also found that when it comes to changing U.S tax law, voters do not want the president to take any action unilaterally. Additionally, they overwhelmingly agree that Washington needs to do its part by reforming the tax code for the first time in nearly 30 years. – 84% agree that companies shouldn’t be punished for following the law. – Only 5% of voters said they would like to see the President take unilateral action to change tax laws. – 87% think Washington needs to do its part by updating the tax code as American workers face global competition. Washington State Department of Labor & Industries kicks off a fall campaign that encourages employers to offer light duty work to injured workers. The Stay at Work program provides Washington state employers financial incentives to get workers back to work, allowing them to keep trained workers and control the cost of worker’s comp premiums. We call it a “Win Win”. Aaron Jones, founder of Seneca Sawmill Company and a long-time Eugene resident, died on Monday, September 22, 2014. He was 92 years old. Jones was a prominent industry leader for more than 50 years, guiding the family-owned sawmills in the West through bruising battles with special-interest groups and industry giants bent on driving smaller, family, independent mill owners out of business. He was also one of the earliest mill owners to embrace advances in sawing technology that employed high-strain bandmills and thin-kerf sawing for the purpose of increasing the amount of lumber recovered out of logs. His limitless curiosity and his passion for research and experimentation have resulted in his Seneca Mills in Lane County being considered by many to be the most technologically advanced mills in the world. The Low Carbon Fuel Standard (LCFS) is a proposed state mandate promoted as a way to reduce greenhouse gas emissions. It would require fuel providers (gasoline and diesel) to reduce the fuel’s carbon content by 10% over 10 years. The program has several phases, moving through the increased use of Midwest corn ethanol, imported ethanol, ethanol made form cellulosic materials, and finally a Cap & Trade-like system utilizing the purchase of offsets – all built into the price of the fuel. From Business OregonOregon has been awarded $300,000 in a third round of federal grant funding to help Oregon companies promote their products to customers around the world through the State Trade and Export Promotion (STEP) Program. Since 2012, STEP-funded export promotion grants totaling $594,000 helped 170 Oregon companies achieve immediate sales of more than $21 million. These sales were a direct result of attending trade shows and other foreign activities with the grants. These grant recipients also reported estimated future sales of more than $80 million as a result of the connections made at the shows. “Few measures deserve to be more roundly rejected than Senator Udall’s amendment to repeal free speech rights enshrined in the Constitution and give politicians more control over Americans participation in the nation’s policy and political debates. Oregon workers’ compensation costs will decrease an average 5.3 percent in 2015, the Department of Consumer and Business Services (DCBS) announced this month. Can an Independent Contractor share your trade secrets? Think Your Independent Contractor Is Prohibited From Disclosing Your Trade Secrets? Think Again. A recent case out of Massachusetts held that, as a matter of law, in the absence of a confidentiality agreement (or a formal confidentiality policy), an independent contractor was free to disclose a company’s trade secrets, including customer names, pricing information, business processes and work flow patterns, information about business relationships with other companies, and accounting records.